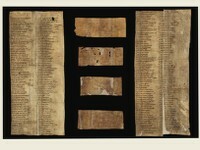 Description: With the financial backing of e-lib.ch (the “Swiss Electronic Library”), a total of 100 manuscripts from various Swiss Libraries has been digitized by the end of the year 2011. e-lib.ch is a joint project of the Swiss University Conference, the ETH-Board (Board of the Swiss Federal Institutes of Technology) and the Federal Office for Professional Education and Technology (OPET). This subproject has been commissioned by the Swiss Academy of Humanities and Social Sciences (SAGW). Steering Committee: Prof. Rudolf Gschwind and Prof. Dr. Lukas Rosenthaler, Imaging and Media Lab, Universität Basel; Barbara Roth PhD, Manuscript Conservator, Bibliothèque de Genève; Heidi Eisenhut PhD, Director of the Kantonsbibliothek Appenzell Ausserrhoden, Trogen.